The Jetsetter (known as the Aero Glider in Europe and Oceania) is a large kart that appears in Mario Kart Wii. The Jetsetter resembles a Le Mans Prototype racecar and the body has a similar design to the Streamliner, but has more of a rectangular shape as opposed to the Streamliner's wedge-shaped body. The Jetsetter features a three-pointed nose with the middle point shorter and thicker. It has blue wheels, a rear fin and a single dual exhaust port in the back. It is unlocked by receiving a one star rank or better in all 150cc Retro Cups. The Sprinter (its rough equivalent in middle-sized vehicles) is also very similar to the Jetsetter in shape, though the Sprinter is more clearly modeled on Formula 1 racecars. The Jetsetter's bike counterpart is the Spear. The Jetsetter is the fastest vehicle in the game. It also has decent weight, but is actually the lightest large kart in the game. All of the Jetsetter's other stats are severely low; it is notable in that it has the worst handling, off-road, and Mini-Turbo stats in the game, while also having the same acceleration as the Wild Wing. Additionally, Funky Kong's Jetsetter has the best speed stat in the game. The Jetsetter and Spear are the only pair of vehicles in the game in which the weight stats are exactly the same. If Mario or Luigi rides on the Wild Wing, its weight can surpass the Jetsetter's weight by one point. The coloring on the Unlocking Screen shows Donkey Kong's version, while the icon on the Time Trials ghost data depicts Wario's version. The Large Female Mii is the only character to have a Jetsetter with a pink windshield-color than the rest, which have yellow windshields. 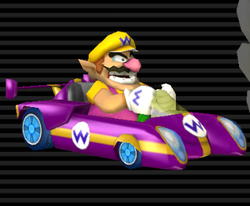 Rosalina is the only driver to use a light yellow windshield, while the rest use standard yellow windshields. If the Jetsetter is driven by Bowser, Donkey Kong or Rosalina, it will not be capable of drifting on any type of off-road terrain. This page was last edited on March 4, 2019, at 17:36.